Our Registered Nurses are licensed professionals who have completed extensive study at an approved and accredited school of nursing. Registered nurses are trained professionals who assist our patients and are able to provide all levels of nursing care including but not limited to comprehensive assessment, wound care, medication administration as well as IV infusion therapy. 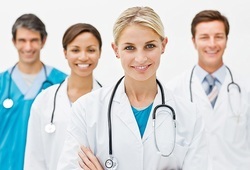 Licensed Vocational Nurses are graduates of an accredited vocational nursing school and have been legally authorized to practice under the supervision of a physician or a registered nurse are also licensed professionals who provide, but not limited to these services: gathering patient information, taking vital signs, giving injections, and assisting our patients in personal hygiene responsibilities. Physical Therapists are licensed professionals that specialize in examination and evaluation of treatment and physical impairment through the use of special exercise, application of heat or cold, and other physical modalities. The goal is to assist persons who are physically challenged to maximize independence and improve mobility, self-care, and other functional skills necessary for daily living. Occupational Therapists help patients improve their ability to perform tasks in the home. They work with patients who suffer from physical disabling conditions. Occupational therapists use treatments to develop, recover or maintain the daily living and work skills of their patients. The therapist helps clients not only to improve their basic motor functions and reasoning abilities, but also to compensate for permanent loss of function. The goal is to help clients have independent, productive and satisfying lives. Our Speech Therapists are licensed professionals trained to treat patients with speech and swallowing disorders, and hearing impairments that affect communication. They also help patients recovering from stroke or other neurological problems. Our Medical social workers assess the psychosocial functioning of patients and families in need of help. Interventions may include connecting patients and families to necessary resources and supports in the community; providing psychotherapy, supportive counseling; or helping patients to expand and strengthen their network of social supports. 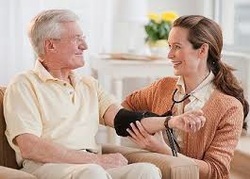 A home health aide is a trained and certified health care worker who provides assistance with activities of daily living such as bathing and grooming in the home. They also assist with light housekeeping and meal preparation. A personal attendant is trained to assist patients with grooming, bathing, light housekeeping, and doctor visits.